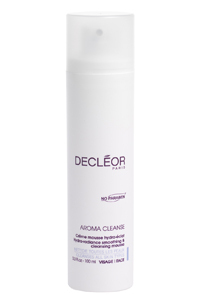 DECLÉOR has just launched the new hydra-radiance smoothing and cleansing moose, Aroma Cleanse. This 3-in-1 cleanser offers deep cleansing, skin polishing and perfecting and finally moisturising and plumping. It is targeted towards sensitive and congested skin and contains grape juice, papaya extract and Japanese white mulberry to exfoliate. Neroli essential oil is key for its decongesting and calming properties and hylauronic acid is aimed at increasing the skin's moisture and elasticity levels. Priced at £25.50, the Aroma Cleanse - hydra-radiance smoothing and cleansing moose is available from now at Decléor salons and selected department stores nationwide. I have been using this for the last week or so! It really is amazing stuff! Cleans like a soap but without stripping your face and leaving it dry.